Every year there are new car buying trends to look forward to and follow. New obsessions to read and research about. And if you haven’t been in the car buying market in a while, things have definitely changed from even just a few years ago. For instance, you can expect to see larger vehicles nowadays. Even the compact sedans are built on bulkier frames. You will find plenty of technology incorporated to make the driving experience more entertaining and productive and hands-free. You will also see a determination to fulfill the consumers’ desire for the perfect ride. Needless to say, 2017 is a highly innovative year for the vehicle industry, and at Mount Airy Toyota we have just what everyone is talking about these days. So you need a new vehicle, and you might even have an idea of what you want. But before you begin your research, test-driving, and budgeting, it’s a good idea to find out what some of the biggest buying trends are so far this year. This can help you narrow down which vehicle will be best fit for you by finding those aspects that have become the big selling elements to today’s hottest vehicles. Whether it’s about saving gas, hands-free connectivity, or even smaller and newer versions of your favorite vehicles, new trends are always being set. Hybrid and electric vehicles are being made at a rate higher than ever. This really is no surprise, seeing how much money and energy is being saved by those who choose to drive a car you can plug in. Who is creating these non gas-guzzlers? At the top of the list, is the Toyota RAV4 Hybrid. 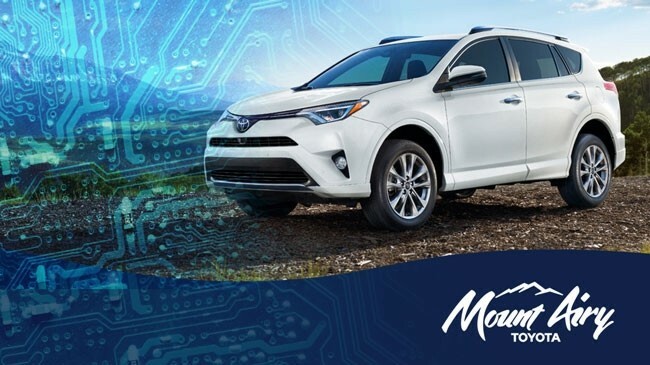 With cool new features and a bit more pep in its step, the Toyota RAV4 Hybrid might be this year’s hottest energy-saving vehicle. With all this manufacturing of electric cars, it must mean the demand is pretty high for them, right? Well, not exactly. At least not yet. Even though electric and hybrid vehicles are not selling any more than they did a few years ago, there is a reason to believe the market will rise drastically. This is due to the fact that these types of cars are only getting better: they can drive longer distances, they have more power, and they are roomier, more comfortable than ever before. Electric just might be the way to go if you are mostly concerned with saving money at the gas pump. 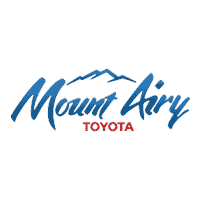 At Mount Airy Toyota, we have plenty of environmentally friendly vehicles. There is the Toyota Camry Hybrid, Toyota Avalon Hybrid, and the Toyota RAV4 Hybrid! 2. Revamping the Classics. Every year you can expect to see new renditions on the stalwart vehicles, such as Camrys and Corollas. But this year, you can expect a bit more. Toyota has big plans for their best selling sedans. In both the Camry and the Corolla there is sure to be more technology, more comfort, and even more power. And, as always, at a great low price. 3. Big Data. To give some idea as to how much of a role technology plays within modern vehicles, the Department of Transportation recently mandated that all new vehicles must be able to “talk” with one another electronically by the year 2020. The hope is that better communication between vehicles will reduce accidents and fatalities for everyone on the road. The high priority of technology being built into our cars is no surprise. Over the past five years especially, we have seen a huge influx in technological advances. We can connect our phones to our cars, enabling us to speak and text without moving a finger or taking our eyes off the road. We can also communicate with our cars to know when something is wrong or when our next oil change is needed. The possibilities are simply endless, and this year we are sure to see some of the most impressive advancements ever. 4. The Crossover Phase Continues. Surely you’ve seen the most recent car craze on the road: an SUV-like vehicle built on top of a car frame. It’s a great idea. It gives car drivers a feel of something bigger but is great on gas and easy to maneuver. It looks like this new type of vehicle is sticking around a bit longer. In addition to updates on the already best-selling crossover, the Toyota RAV4, Toyota has come out with an all-new crossover, the 2018 Toyota C-HR. What’s great about the influx in the creation of crossovers is that small families have an affordable option besides a minivan. Whereas before it was the SUV or the family-van, now there is a third option that perfectly brings in the best of both worlds: comfort and a ruggedness for everyone. So, this is happening. No one is quite sure when it will be in effect, but most believe it will be a gradual process and won’t be complete yet for years. But, just because they are not here now, does not mean they aren’t trending. As a matter of fact, autonomous vehicles seem to be the most popular topic amongst those interested in automobiles. And this is probably because we are already beginning to see tiny elements in modern vehicles, which take the (human) driver somewhat out of the equation. This past year there have been numerous driver-assist technologies incorporated into vehicles, especially in Toyotas. In most Toyota vehicles there are now sensors designed to alert you when you drive too close to another vehicle, or merge from your lane. The steering wheel will even begin to correct itself in some situations, giving you time to adjust and then take over. Pretty smart, huh? We even have cameras that can give a clear view of the back, sides, front, and top of your vehicle to keep you aware of all your surroundings. And if something comes into view, like a vehicle merging towards you, the car is sure to let you know. Makes you wonder if we’ll be having full-blown conversations with our vehicles in the future. Anything is possible. 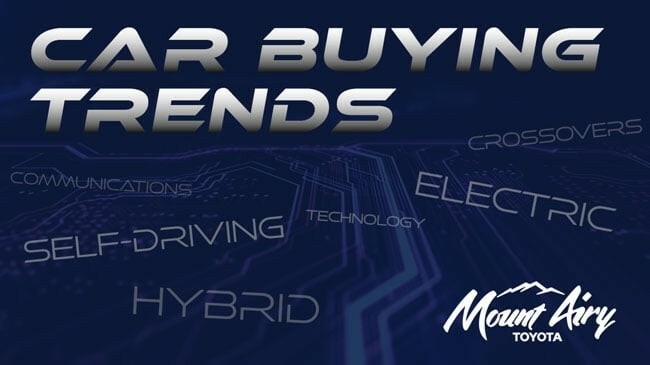 Regardless of which trends are important to you and which are not, we are sure to have what you’re looking for at Mount Airy Toyota. We have the best selections of both used and new vehicles, and we are extremely excited to talk with you about all the innovative features on our sedans, crossovers, and SUVs. There has never been a better time to buy a new vehicle at Mount Airy Toyota. Stop in and test-drive something trendy and new today.